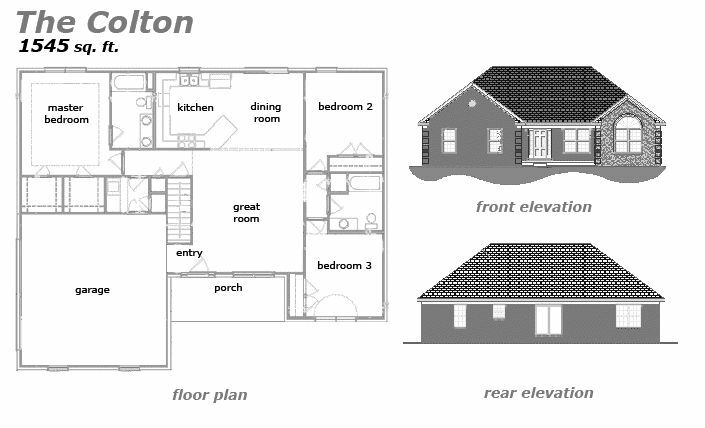 The Colton – 1545 sq. ft.
A stylish 3 Bedroom, 2 Bath brick ranch ready to be built for you! This house has several great features including A master bedroom suite with 2 walk-in closets, lots of counter space in the kitchen with the dining room right next door, and a covered porch out front with a 2 car garage. Jeda Homes thinks there’s something special about turning this blueprint into a home customized just for you. You get to be involved in every step of the process, from the planning to the construction to the final touches. Design the plans to your liking, choose the flooring, counter tops, interior doors, bricks, shingles and more! Nothing in the house will go up that doesn’t conform to your style. There’s never been a better time to build. Contact Jeda Homes Today!